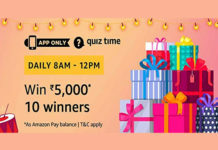 Amazon Super Value Day Quiz | Answer & Win Rs. 9,999 as Amazon Pay Balance. Answers all the 6 Questions Correctly & If you are lucky then you will win Rs. 9,999 Pay Balance (For 20 Winners). This is Amazon App only contest. 3. 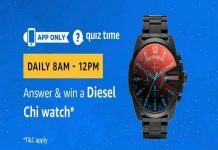 Click on banner and Start the Quiz. 4. Answer all 5 questions correctly. 5. Done. Congratulations !! You are eligible to Win Rs. 9,999 Amazon Pay Balance. Note: You need to answer all 6 questions correctly for eligible to win Rs. 9,999 Amazon Pay Balance. 1. Shopping on Super Value Day gives you cashback on purchase of household supplies and more. 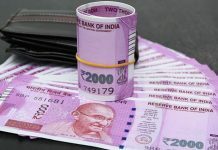 What is the maximum cashback you can avail? 2. Super Value Day occurs on which days of the month? 3. After the order is dispatched, how long does it take for the Super Value Day cashback to be credited to customer’s account? 4. Which of the following would NOT be eligible for the Super Value Day cashback offer? 5. Customers using which bank’s credit or debit card are eligible for the additional cashback on shopping from Super Value Days? 6. During Super Value Days, how many products from Amazon Pantry store are eligible for SVD cashback offer? This Contest will commence on 2nd July from 12:00:01 a.m. (IST) to 11:59:59 p.m. (IST) (Contest Period). The draw of lots will be carried out during the Contest Period for the questions and a total of 40(Forty) participants will be selected as winners by a random draw of lots on the first day. The declared winner(s) will be eligible to win Rs.5000 (hereinafter referred to as “Prize(s)”), which will reflect in the winner’s Amazon.in account as Amazon Pay Balance. 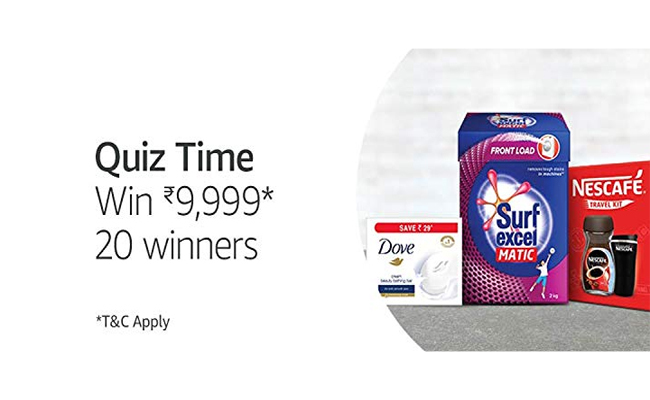 The Super Value Day quiz (“Contest”) is brought to you by Amazon Seller Services Private Limited (“ASSPL”/ “Amazon”) – (“Brand”) and made available to you by Amazon Seller Services Private Limited (“ASSPL”/ “Amazon”). Please read these terms and conditions (“T&Cs”) before entering the Contest.